The official invitation to the Patron Saints' Reunion in September of 2000. The Patron Saints had a long-overdue reunion the weekend of September 23-24, 2000 in Bedford, NY. 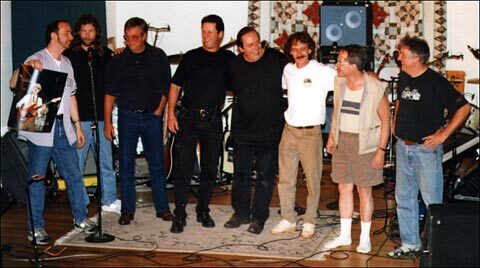 Between 80 and 90 friends, family and fans attended the invitation-only event, which featured most of the members from the band's 1966-1973 timeline (Eric Bergman, Jeff Alfaro, Bruce Miller, Casey Aspray, Joe Ivins, John Doerschuk and Kirk Foster; unable to attend were Jon Tuttle, who passed away in 1994, Frank Stapleton and Paul D'Alton), as well as other musical guests. Saturday the 23rd was an all-day affair, with various folks arriving throughout the day. After reuniting and reminiscing (some of us hadn't seen each other in over 30 years!) and a lovely catered dinner (thank you, Raymond), everybody got ready for the musical section of the evening. First up was Chris Kubie on keyboards and vocals, performing original selections from concerts he had given in 1968 and 1969. Joining him were original Patron Saints Jeff Alfaro on drums (with the original 1966 "The Patron Saints" drumhead still on his kick drum) and Eric Bergman on bass. Numbers included As For Today, Beginning 175, On This Sphere, Opus in Black and White, More Than A Friend (written and performed by Jeff Alfaro) and Brother Of Mine. Next up was old friend Jay O. Sanders on acoustic guitar and vocals, performing original selections Iceberg Child, Fallen Angel and Eric. Various members of The Patron Saints at our September, 2000 reunion in Bedford, NY (l-r): Eric Bergman (guitar, bass, vocals; '66-'73), holding a photo of Jon Tuttle (guitar, piano, vocals; '66-'71), Kirk Foster (bass, guitar, vocals; '71-'73), Casey Aspray (guitar; '68), Bruce Miller (lead vocals, keyboards, harmonica; '66-'68), Chris Kubie (member emeritus, keyboards; '68-'69), Joe Ivins (drums, vocals; '69-'73), Jeff Alfaro (drums, guitar, vocals; '66-'69), John Doerschuk (keyboards, guitar, vocals; '70-'73). Capping off the evening in spectacular fashion was a giant super-jam, featuring as many performers as the stage would hold at one time! In addition to everyone who had played earlier, we had Bruce Miller on vocals and harmonica, Jeff Hahn sitting in on guitar and vocals, Tom "Lurker" Bergman on tambourine, Marc Bailin on bass, Casey Aspray on guitar, and Bruce's wife Sharon on cowbell and vocals. Selections performed included I Can't Keep From Crying, Satisfaction, The Last Time, Not Fade Away, Little Red Rooster, Good Time Music, Honky Tonk Women and Brown Sugar. The whole shebang was recorded on 16-track ADAT (with the ever-dependable and talented Ward Bennett at the engineering helm, accompanied by his wonderful wife, Sharon), videotaped (by the cameraperson extraordinaire, Ceil Mastrorilli), and photographed (by the fleet-of-foot Denise Griggs, among others). None of the weekend could have occurred without the Herculean efforts and support of Jackie Fornerod Haigney. Thank you all!